Innerspring Mattresses, Foam Mattresses, Pressure Relief Mattresses and Alternating Pressure Mattresses. Scroll down to see our selection of Mattresses for sale. Mattresses are used on beds to provide comfort to the patient. We carry a large variety of mattresses for hospital and home care beds, including foam mattresses, innerspring mattresses, pressure relief mattresses and pressure sensing fall prevention mattresses. 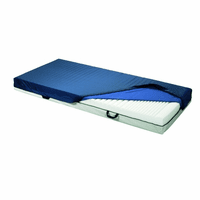 Mattresses are manufactured products designed for sleeping or lying down on. In healthcare mattresses are used to give comfort to the disabled or patients spending the majority of their day in bed. Specialty mattresses, like alternating or pressure relief mattresses have the ability to treat and prevent bed sores. Having a mattress suited for your needs can improve your quality of sleep, leaving you feeling more rested and ready for the day..